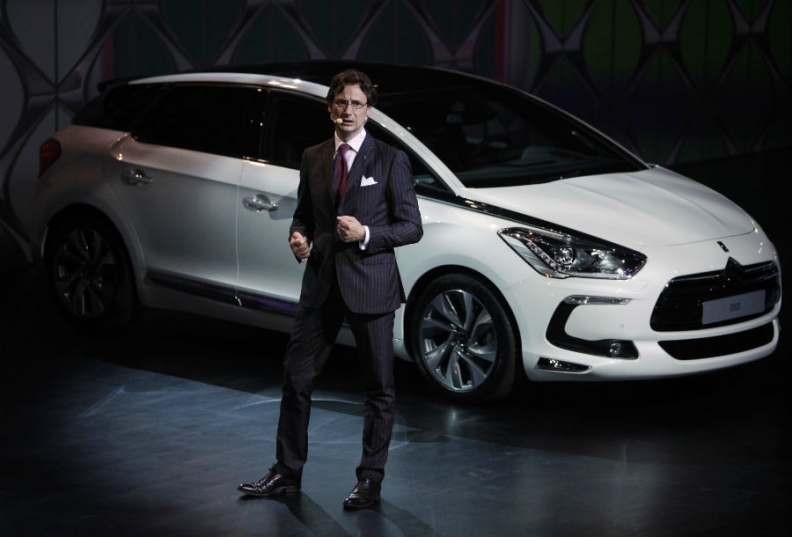 PSA's China boss Gregoire Olivier introduces the Citroen DS5 at a ceremony to launch the DS subbrand in the country. BEIJING (Reuters) - PSA/Peugeot-Citroen is targeting China's luxury buyers as it strives to win a bigger share of the world's largest auto market and expects sales there to reach 15 percent of its global total by 2015. The French carmaker, which last year had 11 percent of its sales in China, aims to almost double its sales of lower-range cars there by 2015 as it comes from behind market leaders General Motors and Volkswagen. Volkswagen's Audi, BMW and Daimler's Mercedes-Benz dominate the premier car market in a country that is ever more important for global auto makers as economic weakness depresses sales in the West. PSA has made its upscale Citroen DS3, DS4 and DS5 available in China for the first time. "The premier market is now 8 percent of the Chinese market, which means one million people are buying luxury cars this year," Gregoire Olivier told Reuters in an interview on Thursday. "In 2020 we believe it will be more than 15 percent for a car market which would have doubled... The DS is addressing this new generation of premier car buyers and we think there is a lot of room even for others." PSA expects those models to compete with Volvo, in a price bracket below the German brands, rather than with the likes of Volkswagen's Passat or the Buick Lacrosse from General Motors, at the top end of the regular car market. The DS5 is priced at 300,000-350,000 yuan ($47,000-55,000) with the DS4 at up to 300,000 yuan, on a par with Volvo cars of similar size. Peugeot has begun opening dedicated outlets for the DS in China, designed to be more stylish than its others, and aims to have over 100 of them by 2015. In addition to 200,000 DS cars, PSA aims to expand sales of other models to 750,000 by 2015 compared to the 404,000 that it sold in China last year. It is introducing four new Peugeot cars and four additional Citroen models apart from the DS range. Olivier expects the Chinese expansion to keep on track despite a slowdown in car market growth after the withdrawal of government incentives for buyers in 2010. He expects China's overall car market would continue to grow at 8-10 percent in the coming years due to low penetration in smaller cities and rural areas. Last year, PSA started work on its third China plant, jointly run with Dongfeng Motor Group, which will give the partners a total capacity of 750,000 vehicles by 2015. PSA is also building a factory able to produce 200,000 cars a year with China Changan Automobile Group for its DS line up. GM, Nissan and Honda, are also playing catch-up to the Germans in China's premier market. Nissan will make Infiniti cars in China from 2014 and GM expects Cadillac sales to match U.S. levels by 2015 or 2016. GM sold over 2.5 million vehicles in China last year. Half of them were cheap minivans.